The density of this muffin is unrivaled in flavor and saliva inducing texture. Juicy peaches and ringing-bell shaped blueberries will make you want to sing. Except you won’t be able to with your mouthful (disclaimer: not applicable for ventriloquists). 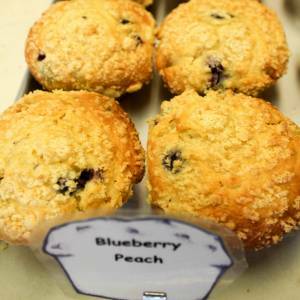 The sweet juices of the fruit and berry brought together in the sweet bread of the muffin are exquisitely sealed together in what is a yummy compliment of texture and flavor.